The latest issue of the Automotive News Europe monthly magazine goes live on Monday. 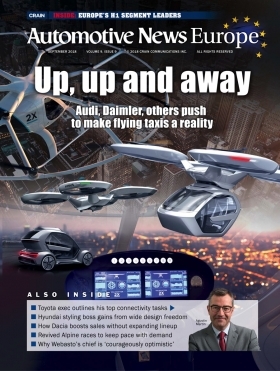 The new edition examines why flying taxis are no longer a fantasy in Europe. Pilot testing of flying taxis is set to start within a year and they could become commercially available as soon as 2025. That is what experts who are working on this game-changing solution told us in our cover story. We look at what is driving automakers such as Audi, Aston Martin and Porsche to invest in these sky-high projects that have the potential to offer a whole new level of premium mobility. One man who is spearheading Europe’s efforts to introduce taxis that fly is Mark Cousin, who is Airbus’s head of flight demonstrators. He explained why flying taxis could solve the problem of massive traffic congestion. In his vision, a flying car would take its passengers from central London to Heathrow airport in 12 minutes, well under the 2.5 hours that are sometimes required today. Hyundai design boss Luc Donckerwolke explained why the South Korean automaker prefers to offer a lineup with specific models for India, China, Russia, Europe and the U.S. rather than a one-size-fits-all solution for all markets. Dacia, Renault’s budget Romanian brand, hasn’t introduced a truly new car since 2012, but it continues to set annual sales records. Dacia is on track to sell 700,000 cars globally this year compared with about 250,000 in 2008. We analyze how Dacia has become a pillar of Renault Group’s growth and profitability. Renault’s revival of France’s most iconic postwar sports car, the Alpine A110, is gaining traction. Alpine has received 5,000 secured reservations for the new A110 since the car was unveiled last year, resulting in a 14-month waiting list. Alpine has increased production at its factory in Dieppe, France, to 20 cars a day from 15 to reduce waiting times to less than a year. Peugeot has designed the new Rifter, the passenger variant of the automaker’s small cargo van, to appeal to buyers of both SUVs and minivans. As with the rest of the Peugeot range, the Rifter is also available in the higher-end GT Line trim. Agustin Martin, Toyota’s vice president new mobility & connected car, told us that the biggest challenge he faces in delivering connected cars is adjusting a 100-year-old planning process to the “I want it now” mindset of today’s consumers. Our Supplier Talk from the Top section features interviews with two leading executives. Roof system specialist Webasto wants to boost the German supplier’s sales by 43 percent to 5 billion euros by 2020. While Chairman Holger Engelmann is “courageously optimistic” that the tough target can be reached, he also worries that the industry could be badly damaged if a trade war between Europe and the U.S. continues to escalate. Interior supplier International Automotive Components Group is increasing the number of premium automakers it serves. This growth is set to make the European division the company’s global leader in sales, regional boss Jonas Nilsson said. SUVs and crossovers accounted for one-third of European sales during the first half for the first time. Their volume increased by almost 20 percent in a market that was up by just 2.5 percent. See which models drove this 560,000-unit increase compared with the first half of last year. Concerns about the effects of U.S. President Donald Trump’s plans for increased U.S. import tariffs on Europe’s automakers hit the shareholder value of the auto sector in the second quarter, with Daimler down 15.4 percent and VW slipping 11.2 percent. Suppliers slipped 7.5 percent. In succeeding Sergio Marchionne as Fiat Chrysler Automobiles CEO, Mike Manley has a rough road ahead. His former mentor and boss, who unexpectedly passed away on July 25, left daunting financial targets. Manley’s first act was to lower 2018 targets after a weak second quarter. In our Final Word we examine whether Manley will need to make further revisions as the year progresses.